Narrowband IoT refers to a low power wide area network technology that has been developed to enable network connectivity between a wide variety of devices and services. Narrowband IoT connects devices in a simpler and more efficient manner in an already recognized mobile network. It handles small amount of fairly irregular 2-way transmission data in a more secure and reliable manner. The technology is being considered most suitable for communicating with devices that require small volumes of data over long periods of time, typical of devices connected in IoT networks. NB-IoT provides features such as very low consumption of power, excellent range in underground sites and buildings, easy deployment in existing cellular networks, and lower cost of component. With the rising adoption of the IoT technology in application areas such as smart metering, smart homes, and smart appliances, the demand for NB-IoT chipsets has also increased significantly across the globe. The trend is expected to remain strong over the next few years and the demand for narrowband IoT chipsets is expected to rise at an exponential pace. Transparency Market Research estimates that the market will exhibit a staggering 37.9% CAGR from 2017 to 2025, rising from a valuation of US$45.0 mn in 2016 to US$793.7 mn by 2025. In terms of deployment, the global market for NB-IoT chipset is segmented in the report into standalone, guardband, and inband. Of these, the segment of guardband dominated the global market in 2016, accounting for a massive 41.9% share. Guardband is also expected to remain the most preferred mode of deployment of NB-IoT chipsets as this method helps avoid interference between simultaneous communication channels and prevent crosstalk between two different frequency ranges. The segment is expected to exhibit a promising 38.8% CAGR from 2017 to 2025, retaining its position as the leading contributor of revenue to the global market. Other segments are expected to closely follow in terms of growth rate over the forecast period, with the segment of inband exhibiting a 37.8% CAGR and the segment of standalone NB-IoT chipset deployment expanding at a 36.3% CAGR over the forecast period. Despite high growth rate, the segment of standalone NB-IoT deployment is expected to lose its market share by the end of the forecast period. In terms of geography, the market for NB-IoT chipset has been segmented in the report into Asia Pacific, North America, Europe, Middle East & Africa (MEA), and Latin America. Of these, the Asia Pacific market held the leading market share in terms of revenue contribution to the global market and is expected to retain its dominance during the forecasted period as well. 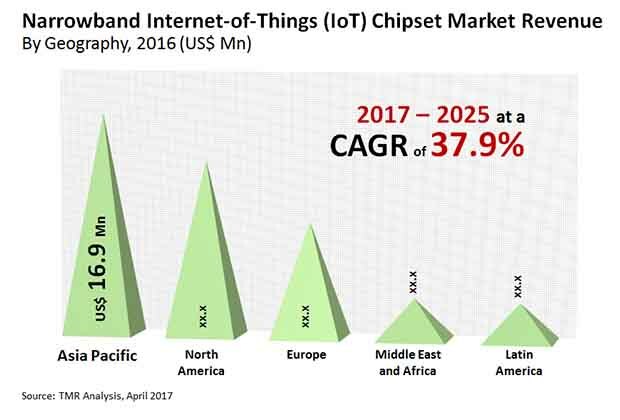 Expected to exhibit an exponential 43.9% CAGR from 2017 to 2025, the Asia Pacific market for NB-IoT chipset is projected to see a massive increase in its revenue contribution to the global market, from nearly 37.5% in 2016 to 55.2% in 2025, of the overall revenue of the global market. The rising demand for deployment of smart meters and the adoption of smart city concept in countries such as China, Singapore, and India are expected to be the key drivers of the NB-IoT technology in the region. Countries such as China and South Korea will further stimulate the market for narrowband IoT chipsets in the region owing to the presence of several manufacturers. Some of the leading players operating in the global NB-IOT market are Huawei Technologies (China), Qualcomm, Inc. (The U.S.), u-blox Holding AG (Switzerland), Altair Semiconductor (Israel), Sequans Communications (France), Intel Corporation (The U.S.), Verizon Communications, Inc. (The U.S.), Telefonaktiebolaget L. M. Ericsson (Sweden), and Vodafone Group Plc (United Kingdom). NB-IoT, which is being designed exclusively for the purpose of IoT communication, does have a dominating technological performance and dominant service capabilities over the existing M2M technologies. The requirement of NB-IoT in 200 kHz frequency makes it easier to fully utilize the operators' scattered spectrum. This would provide a support capability, which is 100 times as many connections compared to 4G connectivity. It has a sensitivity that is 100 times higher compared to that of 2G and it can increase the battery life of IoT devices increased up to 10 years.NB-IoT chipset also have low device unit cost and better network scalability. Thus, they can be used extensively across various industry applications.Thus, the rise in demand for smart appliances such as connected LED bulbs and connected temperature sensing devices is expected to create growth opportunities for NB-IoT chipset manufacturers during the forecast period. The Narrowband IoT chipset market is expected to expand significantly in the next few years, as low speed reliable data transfer and high level of reliability are anticipated to replace turbo codes with the convolutional codes for the purpose of downlink transmissions. With technological advancement in smart appliances and smart metering segment with higher adoption of Guardband deployment are fueling the growth of the Narrowband Internet-of-Things Chipset market. Based on deployment, the market has been segmented into three types Guardband, Inband, Standalone .A guard band is a tapered frequency distribution range which separates two wider ranges of frequency. This actually ensures that concurrently used telecommunication channels does not experience any kind of interference, which should actually result in a declined quality for both types of transmissions.The growing demand of NB-IoT in Smart appliances and smart metering is actually driving the market.The guardband concept is applied to both wired and wireless communications. It also helps to simplify the process of signal filtering for software, hardware or both. The market of guardband is anticipated to witness a high growth rate during the forecast period owing to its capability of reduced turnaround time during high network traffic .In addition to that, An inband management is involved in managing devices using the common protocol such as telnet or Secure Shell(SSH), for the purpose of operating network service securely over an unsecured network. The growing adoption of Guardband and Inband deployment in different smart applications is expected to drive the market in the forecasted period.Based on application, the market is segmented into seven segments they are like trackers, wearable devices, smart appliances, smart metering, alarms, detectors and others.Geographically, the Narrowband Internet-of-Things Chipset market is categorized into North America, Europe, Asia Pacific, Latin America, Middle East and Africa. The market for NB-IoT chipsets has been provided in (USD million) in terms of revenue and the CAGR for the forecast period of 2017 to 2025. The key players in the Narrowband Internet-of-Things Chipset market have been competitively profiled across the five broad geographic regions. This competitive landscape is inclusive of the various business strategies adopted by these major players and their recent developments in the field of Nb-IoT chipsets. Further, the report includes the market attractiveness analysis of different deployment of NB-IoT chipsets and insight into the major application area of the NB-IoT chipsets. The report also provides assessment of different drivers that is impacting the global market, along with the restraints and opportunities that has also been covered under the scope of this report. For each segment (such as deployment type, applications), market dynamics analysis has been provided. All these factors help in determining different trends that has been impacting the overall market growth. Moreover, after taking into consideration all this factors, an extensive analysis of the region wise growth parameters of Narrowband Internet-of-Things Chipset market along with the overall assessment for the forecast period of 2017-2025 has also been provided within this report. Some of the leading players operating in the market are like Huawei Technologies (China), u-blox Holding AG (Switzerland), Sequans Communications (France), Qualcomm, Inc. (The U.S.), Verizon Communications, Inc. (The U.S.), Altair Semiconductor (Israel), Vodafone Group Plc (United Kingdom), Intel Corporation (The U.S.) and Telefonaktiebolaget L. M. Ericsson (Sweden) among others.